This example shows how to solve a Mixed-Integer Quadratic Programming (MIQP) portfolio optimization problem using the problem-based approach. The idea is to iteratively solve a sequence of mixed-integer linear programming (MILP) problems that locally approximate the MIQP problem. For the solver-based approach, see Mixed-Integer Quadratic Programming Portfolio Optimization: Solver-Based. Having no more than M assets in the portfolio, where M <= N.
Having at least m assets in the portfolio, where 0 < m <= M.
Having semicontinuous constraints, meaning either x(i)=0, or fmin≤x(i)≤fmax for some fixed fractions fmin>0 and fmax≥fmin. You cannot include these constraints in quadprog. The difficulty is the discrete nature of the constraints. Furthermore, while the mixed-integer linear programming solver does handle discrete constraints, it does not address quadratic objective functions. This example constructs a sequence of MILP problems that satisfy the constraints, and that increasingly approximate the quadratic objective function. While this technique works for this example, it might not apply to different problem or constraint types. Begin by modeling the constraints. These inequalities both enforce that x(i) and v(i) are zero at exactly the same time, and they also enforce that fmin≤x(i)≤fmax whenever x(i)>0. This objective function is nonlinear. The MILP solver requires a linear objective function. There is a standard technique to reformulate this problem into one with linear objective and nonlinear constraints. 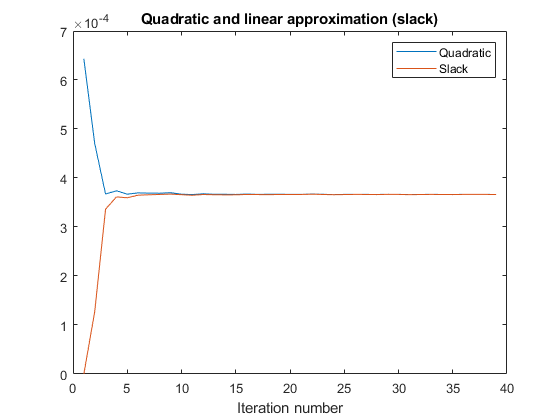 Introduce a slack variable z to represent the quadratic term. This has the form Ax≤b, where A=2xkTQ, there is a -1 multiplier for the z term, and b=xkTQxk. This method of adding new linear constraints to the problem is called a cutting plane method. For details, see J. E. Kelley, Jr. "The Cutting-Plane Method for Solving Convex Programs." J. Soc. Indust. Appl. Math. Vol. 8, No. 4, pp. 703-712, December, 1960. Load the data for the problem. This data has 225 expected returns in the vector r and the covariance of the returns in the 225-by-225 matrix Q. The data is the same as in the Using Quadratic Programming on Portfolio Optimization Problems example. Set the number of assets as N.
Create continuous variables xvars representing the asset allocation fraction, binary variables vvars representing whether or not the associated xvars is zero or strictly positive, and zvar representing the z variable, a positive scalar. The lower bounds of all the 2N+1 variables in the problem are zero. The upper bounds of the xvars and yvars variables are one, and zvar has no upper bound. Include semicontinuous constraints. Take the minimal nonzero fraction of assets to be 0.001 for each asset type, and the maximal fraction to be 0.05. Include the inequalities x(i)≤fmax(i)*v(i) and fmin(i)*v(i)≤x(i). Include the constraint that the portfolio is 100% invested, meaning ∑xi=1. Set the risk-aversion coefficient λ to 100. Define the objective function rTx-λz and include it in the problem. To solve the problem iteratively, begin by solving the problem with the current constraints, which do not yet reflect any linearization. Prepare a stopping condition for the iterations: stop when the slack variable z is within 0.01% of the true quadratic value. Keep a history of the computed true quadratic and slack variables for plotting. Set tighter tolerances than default to help the iterations converge to a correct solution. Compute the quadratic and slack values. If they differ, then add another linear constraint and solve again. After you find a new solution, use a linear constraint halfway between the old and new solutions. This heuristic way of including linear constraints can be faster than simply taking the new solution. To use the solution instead of the halfway heuristic, comment the "Midway" line below, and uncomment the following one. Plot the history of the slack variable and the quadratic part of the objective function to see how they converged. What is the quality of the MILP solution? The output structure contains that information. Examine the absolute gap between the internally-calculated bounds on the objective at the solution. The absolute gap is zero, indicating that the MILP solution is accurate. Plot the optimal allocation. Use xLinInt.xvars, not assets, because assets might not satisfy the constraints when using the midway update. You can easily see that all nonzero asset allocations are between the semicontinuous bounds fmin=0.001 and fmax=0.05. How many nonzero assets are there? The constraint is that there are between 100 and 150 nonzero assets. What is the expected return for this allocation, and the value of the risk-adjusted return? The expected return is 0.000595107, and the risk-adjusted return is -0.0360382. More elaborate analyses are possible by using features specifically designed for portfolio optimization in Financial Toolbox®. 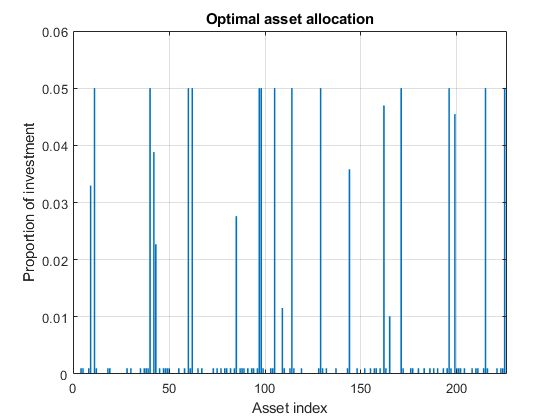 For an example that shows how to use the Portfolio class to directly handle semicontinuous and cardinality constraints, see Portfolio Optimization with Semicontinuous and Cardinality Constraints (Financial Toolbox).